UNITED STATES: German manufacturer Senvion has unveiled an upgraded 3.6MW turbine for the US and Canadian markets, as well an adaptation to its modular 2MW series and plans for manufacturing facilities in the region. Senvion's 3.6M140 turbine is an up-rated version of the 3.4MW machine previously available in North America. Senvion said the new 3.6MW machine is best suited to wind sites in the US northeast and Great Lakes regions. The 3.6M140 turbine will be available for hub heights from 80- to 160-meters. The 3.6M140 model was first announced by Senvion at the WindEnergy Hamburg event in Germany in September 2016. The company also announced it had adaptated its series of modular 2MW turbines to the North American market. These machines will be targetted at projects in Texas, Oklahoma, the Great Plains and Canadian Prairies. "By introducing a whole new range of turbines to the North American market, Senvion is taking its product portfolio to the next level. We are addressing the need for highly competitive, modular technology that can be adapted to project specific needs," said Senvion CEO Jurgen Geissinger. Senvion is looking for its new series of modular 2MW-class turbines and the upgraded 3.6MW machine to bring it past the 2GW mark for installed capacity in the US over the next 18 months, with the goal of eventually opening US-base manufacturing facilities. Helmut Herold, the company's North American CEO, told a news conference at AWEA Windpower 2017 that the details of the new machines will be announced later, but the new 2XM "family of products" will feature a range of rotor sizes and tower heights to allow developers to tailor machines to a variety of conditions. The new machines "fill the gap" in a product line that tends to be focussed on larger turbines, said Herold. Herold acknowledged it is more difficult for Senvion to compete when importing turbines from Europe, especially moving away from more accessible markets on the east coast and Texas into the US Midwest. But once it books 1GW of orders, it will start to look at US-based manufacturing of large components like nacelles and blades, possibly in the 2018 or 2019 timeframe. "One of the great opportunities in the US is you have large projects. Lining up three, four, five projects would create that kind of volume." 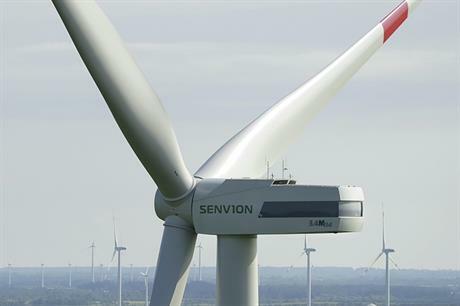 Senvion wants to be the "challenger brand" in a market dominated by Vestas, GE and Siemens. "We are well aware of the power of the big three in the US, but we think there is a space for alternatives," Herold added.